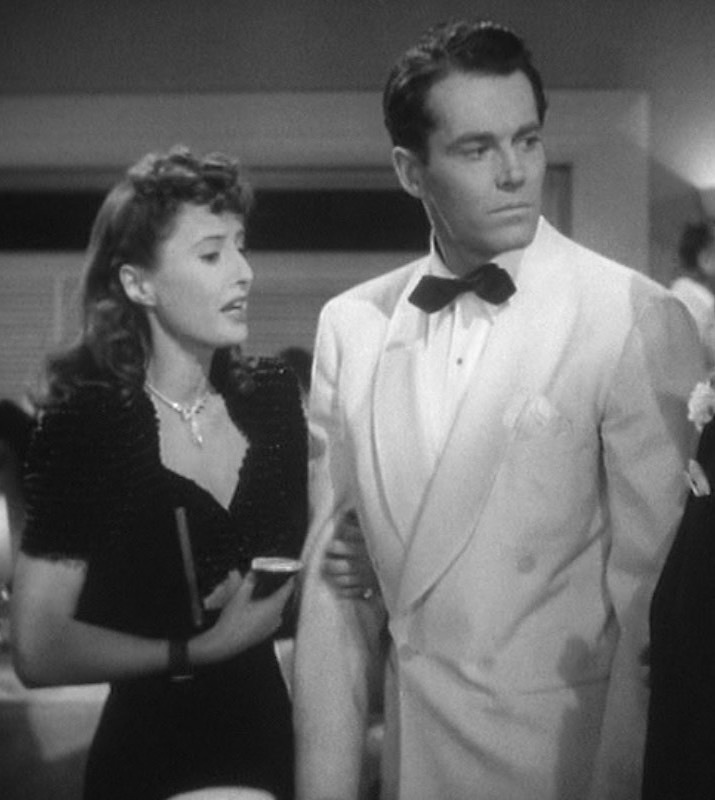 To celebrate the birthday today of my wonderful, patient, and charming girlfriend, I’d like to highlight the elegant evening wear worn by Henry Fonda in The Lady Eve, a classic screwball comedy that I first discovered with her family. The Lady Eve is a fun, comedic change of pace for Fonda, who had just received an Academy Award nomination the previous year for the sobering The Grapes of Wrath. As opposed to a Dust Bowl drama featuring death and despair, The Lady Eve‘s set was reportedly plenty of fun for all involved. 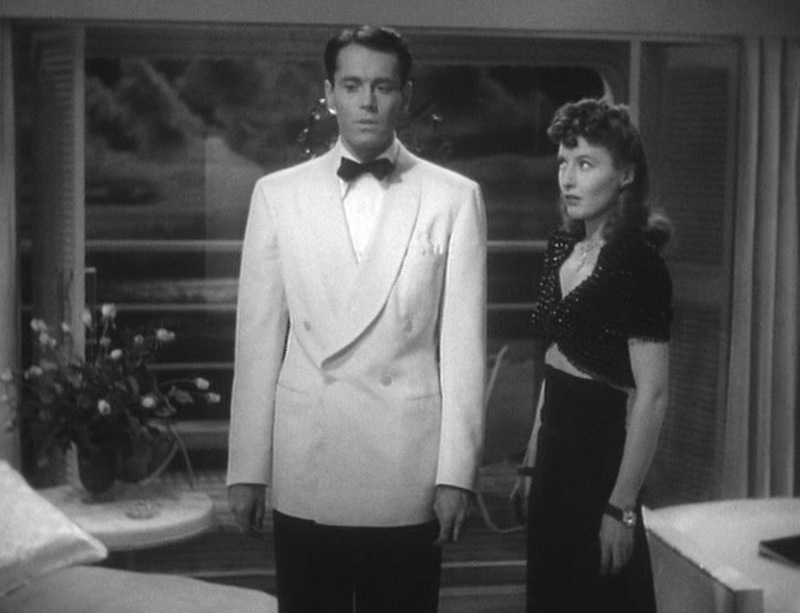 Henry Fonda and Barbara Stanwyck, who would remain lifelong friends, rarely returned to their dressing rooms, instead opting to trade stories and script notes with Preston Sturges, who both wrote and directed the film. Sturges, who would have celebrated his 120th birthday yesterday, had set out to write a fantastic screenplay with Stanwyck in mind for the leading role, and he did just that while in Reno waiting out a divorce from his third wife. Henry Fonda and Barbara Stanwyck take direction while filming the famous flirty scene in Jean’s cabin. The film begins as ophidiologist Charles Pike returns from a year-long expedition studying reptiles (as ophidiologists do) along the Amazon. Nicknamed “Hopsie” in recognition of his family’s successful brewery (“The Ale That Won for Yale”), Pike hopes for a quiet voyage on the SS Southern Queen as he heads back to the States, but his dashing looks and reputable success have him turning the heads of every woman during dinner. Only Jean Harrington is wily enough to force the heir to reciprocate her attention… and understandably so! A few months after Hopsie’s suspicions of Jean’s true motives ruin their chance at romance, she reappears in his life as the “Lady Eve Sidwich”, posing as a posh English socialite who pretends not to recognize her former near-paramour. The Pike family hosts a dinner party in honor of “The Lady Eve”, calling for Hopsie to don his finest formal regalia. The astounded heir first ruins his evening tailcoat and white tie kit, then his black double-breasted dinner jacket, forcing him to return to the dinner in the same off-white dinner jacket he wore during his first encounter with Jean on the Southern Queen. 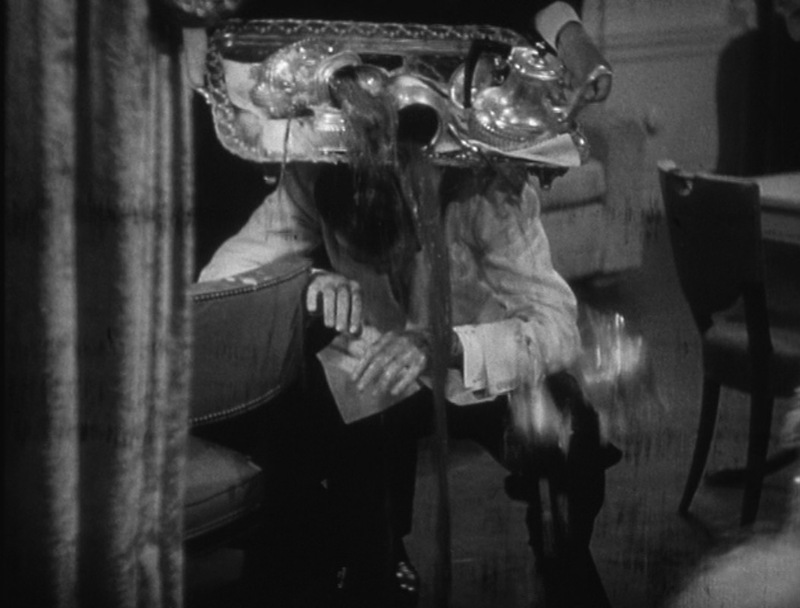 …so, naturally, he finds himself directly under the falling coffee service and yet another dinner jacket bites the dust. More than a decade after the dinner suit, or tuxedo, was increasingly accepted as formal wear in the years following World War I, stylish gents began looking for alternatives to traditional black or midnight blue dinner jackets that would be comfortable yet fashionable in warmer climates. Enter the white dinner jacket. It would be more accurate to describe the color of a “white” dinner jacket as off-white or ivory, providing a touch of contrast against the crisp white dress shirt beneath it. Single- and double-breasted styles were both popular during the emergence of the white dinner jacket in the 1930s, though the double-breasted style eliminated the need for its wearer to don an additional layer that would cover the waist. Thus, a double-breasted dinner jacket would have been very comfortable for Hopsie Pike’s equatorial evening at sea. No matter how comfortable your dinner jacket may be, there’s no sartorial cure for awkwardness. Likely constructed from a light, summer-weight wool, Hopsie’s dinner jacket has a wide self-faced shawl collar that rolls to a 4×1-button double-breasted front with mother-of-pearl sew-through buttons that match the three smaller buttons on each cuff. The relaxed formality in situations calling for white dinner jackets means the lapels are traditionally not faced in grosgrain or satin silk as found on dark dinner jacket lapels, nor are the buttons covered in silk. The ventless jacket has a welted breast pocket where Hopsie wears a white display kerchief and straight hip pockets. 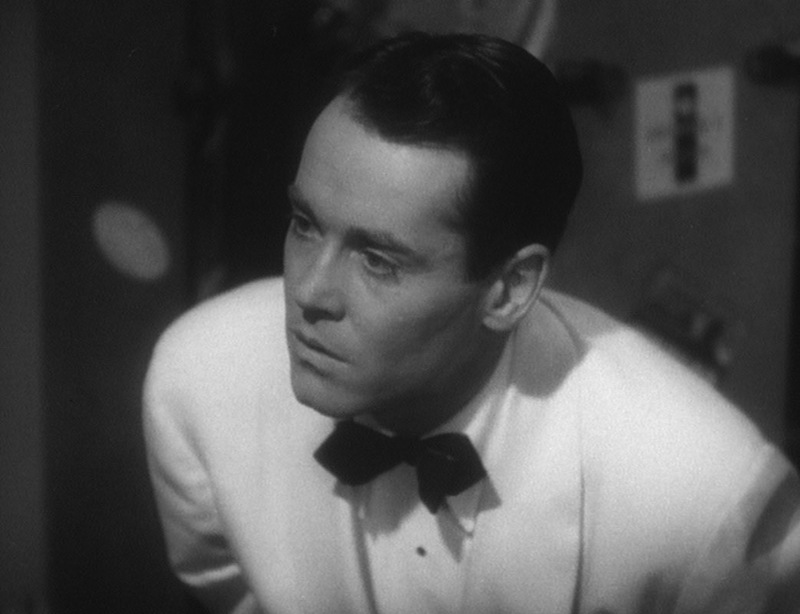 Hopsie appropriately wears a black silk bow tie, and the pointed-end bow tie (also known as a “diamond tip”) nicely balances Henry Fonda’s narrower face. Hopsie’s white formal dress shirt has a large point collar typical of the era’s fashion trends. A later scene that finds Hopsie changing into his other dinner jacket gives us a better look at the shirt, which appears to be a sheer cotton voile with the visible collar, bib, and double cuffs made from thicker marcella cotton. The dress shirt has three small round black studs with metal trim on the front bib. The double (French) cuffs are fastened with a set of thin cylindrical links. A year up the Amazon does nothing to prepare Hopsie Pike for a situation like this. Suspenders (braces) with black tie kits are meant to be useful but not visible, yet the unorthodox position that Hopsie finds himself in during mid-embrace with Jean reveals his white suspenders to the audience. White leather double-hooks on the front and back connect to buttons along the inside of the trouser waistband. The trousers themselves are the same black or midnight blue wool formal trousers that would be worn with a full dinner suit, with silk braiding down each side and plain-hemmed bottoms. In accordance with traditional black tie standards, Hopsie also wears a well-shined pair of black patent leather cap-toe oxford shoes with black dress socks. 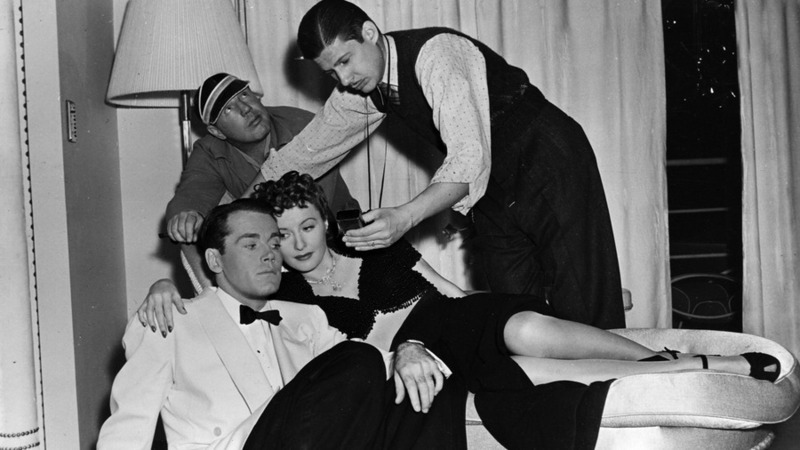 Production photo of Barbara Stanwyck and Henry Fonda filming The Lady Eve. As the black tie dress code was developed and standardized during the early 20th century, there was uncertainty about how a gentleman should wear his timepiece. Early practices with formal white tie stipulated that, if a man must wear a watch with his formal wear, that it be a discreetly placed pocket watch on a simple but elegant chain. However, World War I introduced both relaxed dress codes and popularity of the wristwatches that had been worn by servicemen, and men were increasingly keeping time on their wrist, whether dressed for business or dinner. Hopsie wears a wristwatch with an elongated rectangular case on a brown leather strap. As these were the days before watchmakers like Omega invested millions to have their timepieces on James Bond’s wrist, little attention would have been paid to the exact watch model during production and it’s likely that this is Henry Fonda’s own wristwatch. 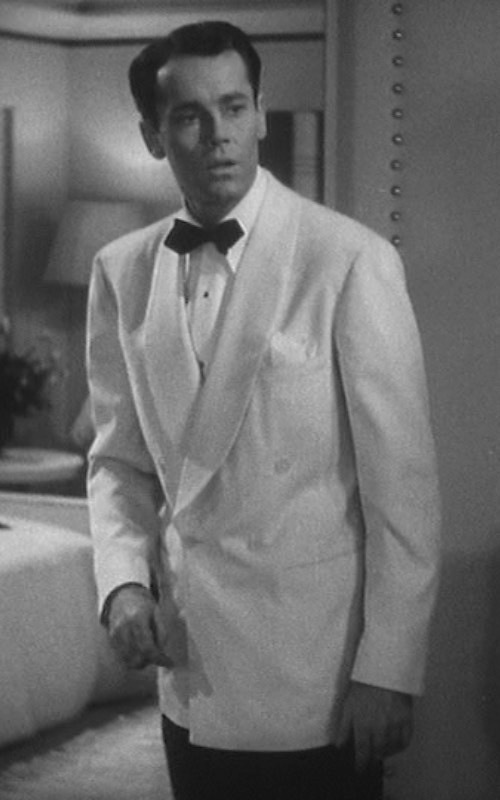 Henry Fonda wears a classic example of the warm-weather white dinner jacket in The Lady Eve, perfectly styled and appropriately suitable for a summer evening at sea. The look would become iconic the following year as Humphrey Bogart dressed in an ivory dinner jacket to brood over his bourbon in Casablanca. This weekend also presents your last opportunity to wear white before Labor Day… if you’re the sort of the Northern Hemisphere dweller who follows such practices. Check out the movie… and take care of your dinner jackets! You’re certainly a funny girl for anybody to meet who’s just been up the Amazon for a year. Interestingly, context clues on the checks written by her father indicate that Jean’s attempted seduction at sea seems to be set on August 28, 1940, exactly 78 years and two days ago! 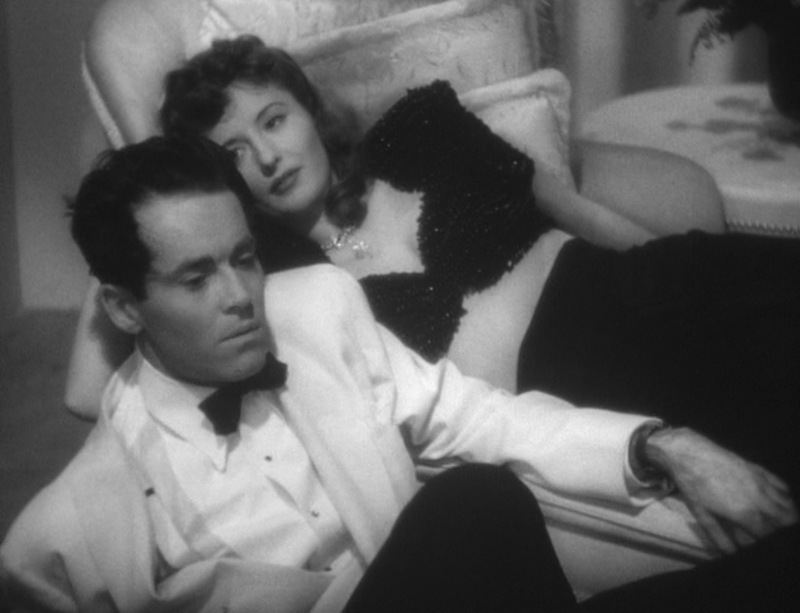 It’s been decades since I watched this film, but I always remember the seduction scene where Stanwyck teases Fonda. They were great in this film. I’m always amazed when dramatic actors make a great light comedy and are never given the chance to do so again afterwards. Like Rod Taylor in “Sunday in New York” or Harrison Ford in “Working Girl”. And Happy Birthday to your lady!